Relax with the true reclining bath lift. 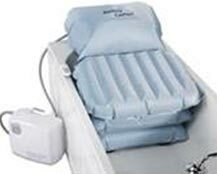 The Bathing Cushion is designed to offer increased stability and comfort. Weighing only 2 kgs (4.4lbs) and featuring a new carry handle, it is supremely portable making it ideal for taking away on visits or on holiday. It can also be set up or removed in seconds and requires no fixtures or adaptations to an existing bathroom.